Olga V. Mack is head of legal at ClearSlide. The so-called “sharing economy,” which some affectionately (or pejoratively) describe as the “gig economy,” is becoming a highly politicized issue in the 2016 presidential election. As the “sharing economy” capitalizes on crowdsourcing everyday tasks or “gigs,” lawmakers and politicians alike are chiming in. 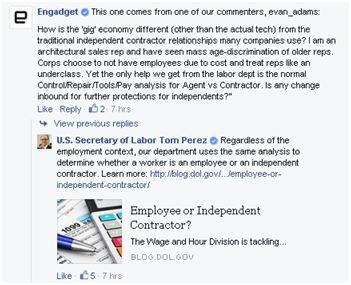 The issue of whether to classify workers as independent contractors or “1099 workers” instead of full-time W2 workers is already in the national debate. For example, Hillary Clinton recently made a few statements on the topic as she has been trying to figure out the best stance to take. The debate highlights a tradeoff between innovation and employee protection — both important public policy interests. In a nutshell, while many “sharing economy” startups such as Uber, Lyft and Airbnb rely on the 1099 independent contractor classification, such independent contractors or “1099 workers” do not get the same benefits as W2 employees, such as health benefits, overtime pay and sick leave pay. Under the current legal climate, there is inherent tension between innovation and employee protection, especially for “sharing economy” startups and technology companies. For “sharing economy” startups and technology companies, navigating the thin line between 1099 independent contractors and full-time W2 workers is very important, because a misclassification may threaten a company’s entire existence. This is illustrated in the recent demise of Homejoy. Clearly, addressing this issue in a timely manner is crucial. Given how polarizing this issue is, however, reaching a timely solution has become increasingly unlikely. 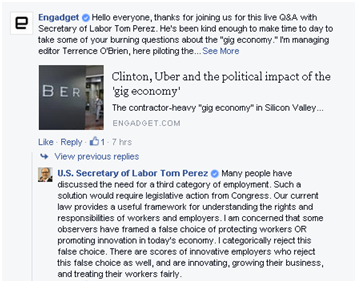 On July 26, 2015, U.S. Secretary of Labor Tom Perez discussed the “gig economy” and worker misclassification during the Facebook Q&A. The current employee/contractor classification structure is rigid and it is rigidly enforced. This is not about to change. 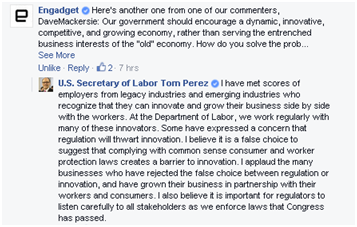 Secretary Perez emphasized that the Department of Labor “uses the same analysis to determine whether a worker is an employee or an independent contractor.” Moreover, the current laws are not designed to be flexible or to accommodate new economic models. It is no secret that the status quo is lethal for many new “sharing economy” startups and technology companies. These innovators may not survive if the current 1099 classification regulations are so rigidly enforced and/or no alternative regulatory framework is created. Legislative action may be required to make the existing classification regulations more accommodating of new economic models while still protecting the rights of workers, who are individually in a more vulnerable position because they have historically had less bargaining power and fewer resources than large companies. Actively enforcing the current classification laws in all contexts is a priority for the current administration. This will not change unless the laws change. 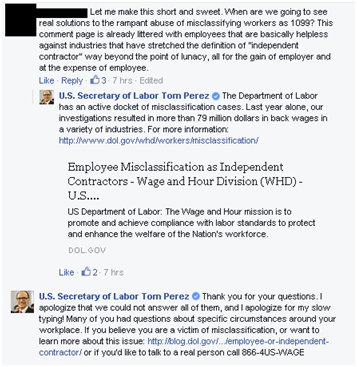 Secretary Perez stated: “[l]ast year alone, our investigations resulted in more than 79 million dollars in back wages in a variety of industries.” Moreover, he encouraged the audience to report all suspected classification violations to the Department of Labor. The cold reality from Secretary Perez is refreshing and liberating, because it frames the issues that we as a nation need to address. Soon. However, the comments from Secretary Perez, presidential candidates such as Hillary Clinton and numerous others have politicized and complicated an issue that may otherwise be more easily and rationally solved. Of course, such politicization will make it much harder to modify the existing, outdated laws and change the status quo. So long as this status quo is prolonged by politicized inaction, it will be to the detriment of the “sharing economy,” new economic models and the national economy as a whole.